In San Diego, we joined the 25th Annual Baja Ha-ha. I have in the past not been much of a joiner, and I must admit that it was mostly James who felt that we should participate in this rally. It turned to be an absolutely wonderful experience, and I'm so glad that we did it! We departed from San Diego on October 29th with what was described as a parade. I wanted to skip the parade. I thought it sounded silly. I am very, very glad to have been so very wrong. 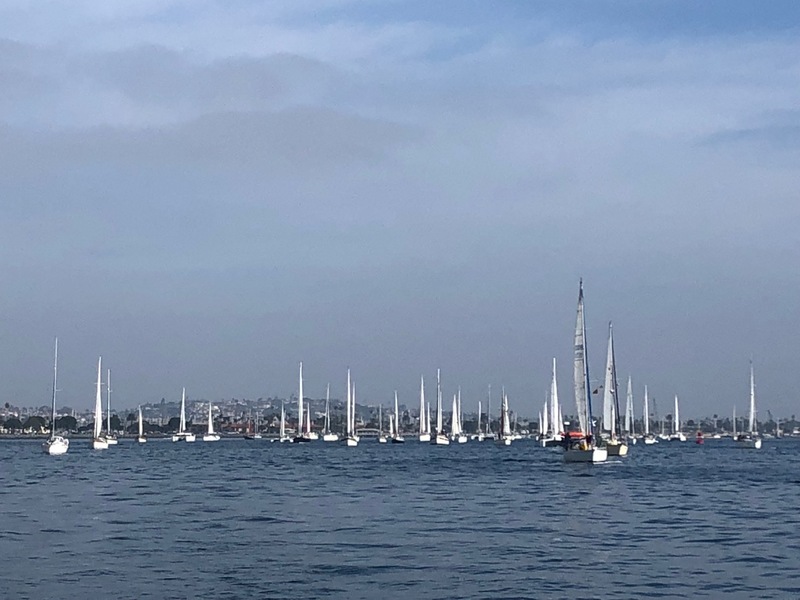 It turns out that sailing out of the San Diego Bay with the 150ish other boats holding 500ish people was incredible. 150 boats didn't sound like a lot of boats in my mind. 150 boats sure felt like a lot of boats on the water. At the offical start of the "race", there was a live mariachi band, every boat blew their air horns (which we normally have on hand for emergency or fog alerts), every voice was shouting, the police boats were running their sirens, and the fire boats were spinning in circles shooting off their hoses. Honestly, I'm sitting in the cockpit in La Paz almost a month later crying as I watch this video and remember the intensity of this experience. Let's take a closer look at those fire boats. Oh, the joy of it all! There were many tasks that, in San Francisco, we left "to do in San Diego." We anticipated arriving several weeks before the event and having lots of time there, but a death in the family changed our priorities around departure and we took a good, slow meander down the coast. We ended up with a week in San Diego. We made several major purchases: our propane grill, stand-up paddleboard (SUP), and tandem kayak. We picked up the last two on Saturday, strapped them to the boat Sunday (no small task in itself), and departed on Monday. There were zillions of other tasks; mostly, in San Diego, we worked from wake to sleep. A light spot was the arrival of our dear friends Gabe and Paige, who spent the last weekend with us before Paige flew home to San Francisco and Gabe kindly and bravely joined our crew for the journey! After the hullabaloo of the parade, we settled into our new state as a fleet. As we funneled out of San Diego Bay, we began close together. Here's what that looked like on our chart plotter. The first passage was 3 days and 2 nights, from San Diego to Bahia Tortuga, Turtle Bay. 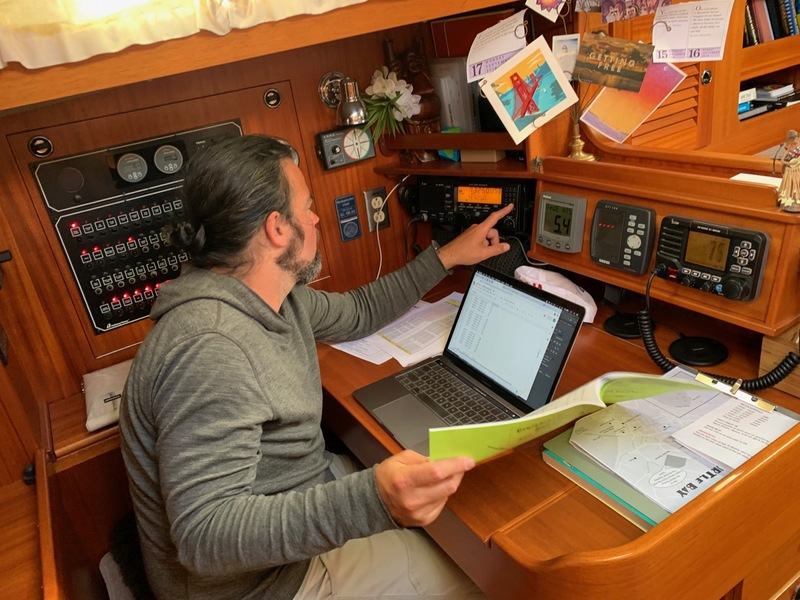 The captain laid out the shifts: we each had a 5 hour watch of mostly-daylight, and we each had a 3 hour watch at night. We were all nervous and excited for our first nights. It went just fine. 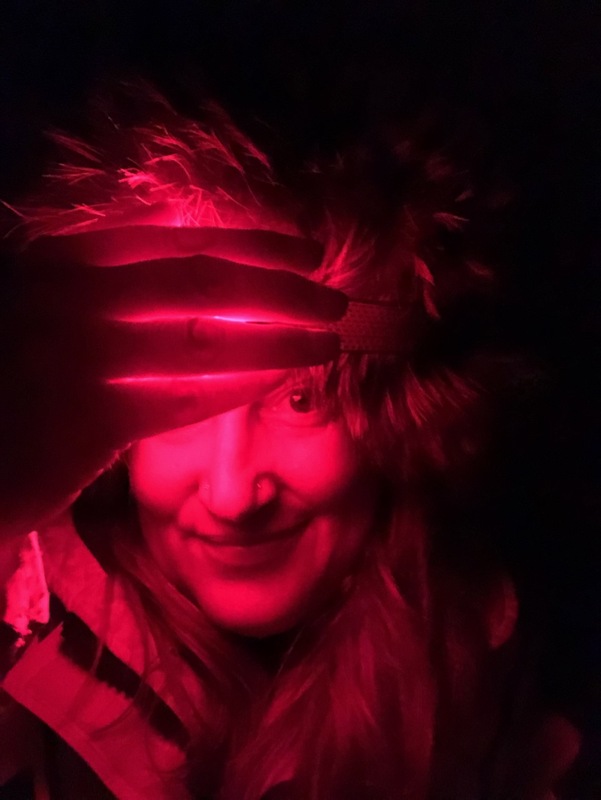 It was still cold at night, and I wore my favorite hat, which is a ridiculous and magnificent foxtail confection that I bought in a thrift store in Florida on a magical weekend with my mom and grandmother. I took a self-portrait because I thought Gram would be happy to see me adventuring in the hat. (Hi, Grandma!) The light in the photo is red because we use red lights at night on watch to preserve our night vision. On the trip down the California Coast, we were usually 2-5 miles out to sea. We could still see land along the our port side. At last, now, we got far enough out that could no longer see land at all. 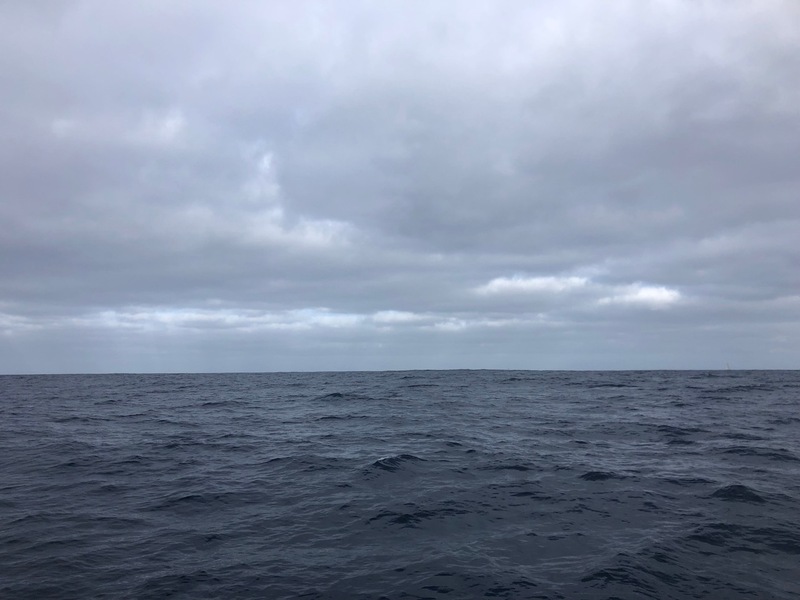 I can't remember now how far that was; we were at some points 10 nautical miles out, at others 25. The boats also naturally spread out over time. Some folks prefer to sail closer to shore, some farther out to sea. Some boats are faster and others are slower. 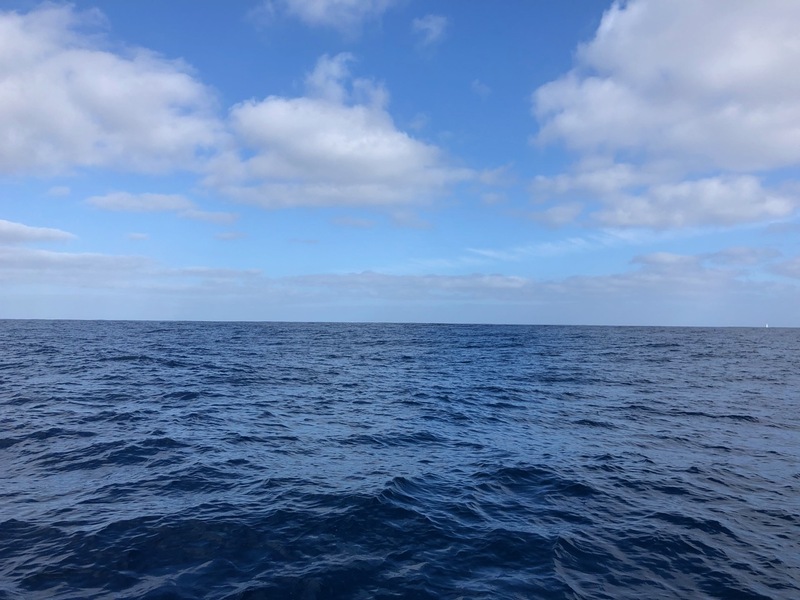 The wind was very light throughout this leg, so we were motor-sailing, which means we ran our engine for primary momentum, with our main sail raised for a little extra oomph from wind when feasible, but mostly to provide a nice stability in relation to the waves. Before I learned to sail, when I imagined being at sea, the idea of being far from land was terrifying to me. It turned out, when I finally had that experience, I adored it. It was heavenly: just sky and sea, sky and sea, and occasionally a boat in the distance. This is a rare bright clear moment. Mostly the first two days were grey and cloudy. The nights were also cloudy, no stars or moon; the nights were very dark. Finally on the third day/second morning, we had a sunrise and not just a brightening fuzz. First light was an absolutely astonishing feeling. It feels like a rebirth, truly. And then the sun rose. OH MY EVERYTHING THE SUN ROSE FROM THE SEA. 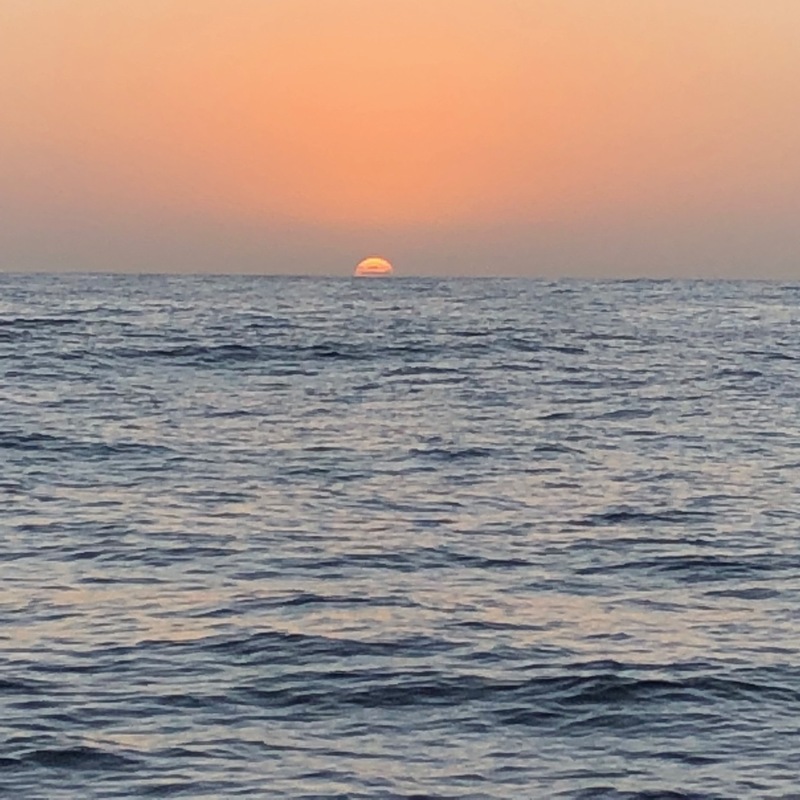 For a long time, James and I have used our awareness of the sunrise and sunset as one of the measures of the quality of our life, where the bigger and event the rises and sets feel, the better we are living. Because really: WOW. We feel incredibly lucky to have had Gabe to share this with. He was the perfect companion. We heard a whole lot of stories for other boats over time about their crew experience, and we were unusually happy and harmonious together. James and I were truly glad to have Gabe there for these precious experiences. and then a daily net at 09:00. The net began each day with a query about medical emergencies. One of the boats had three physicians onboard, and they kindly offered advice when people needed it. 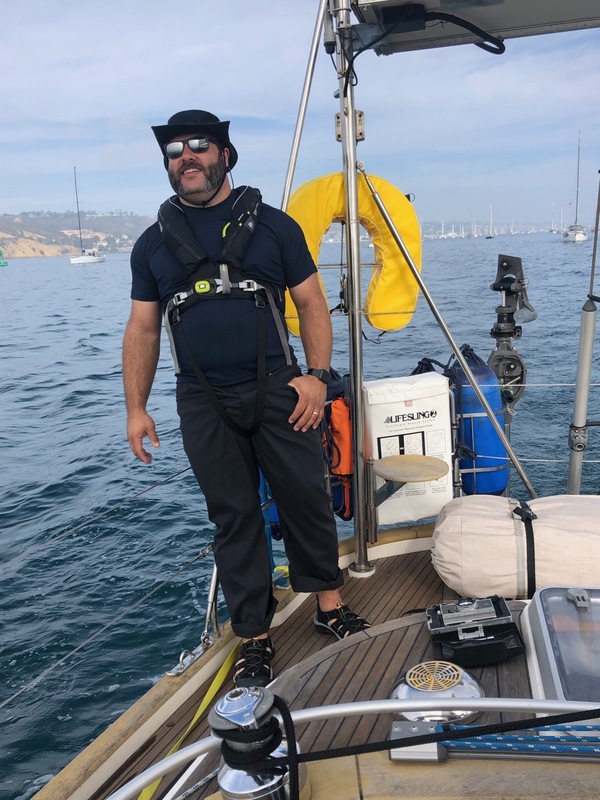 The second query was whether anyone had a mechanical emergency, a mechanical issue that was significant enough to keep them from sailing onward. There was not enough wind to sail for the first 2 legs of the Ha-Ha, so we motored for many days. For a lot of folks, this was far more use than their motor was accustomed to, and many boats had issues. There were several professional mechanics in the fleet as well as many wise people, and everyone gave of their time and skill kindly. After major mechanical issues came the weather forecast. From there, the net would carry on, each day a mixture of 911, the NY Times, and the National Enquirer. Folks would ask for help, share stories of their fish catches, discuss their sailing plans, etc. The Ha-Ha organizers do not provide medical support, official weather planning, or route planning; you can imagine, legally, that this isn't possible. The rally participants support each other along the way, and the rally organizers do an incrediby gracious job of balancing facilitation and leaving you to your own devices. 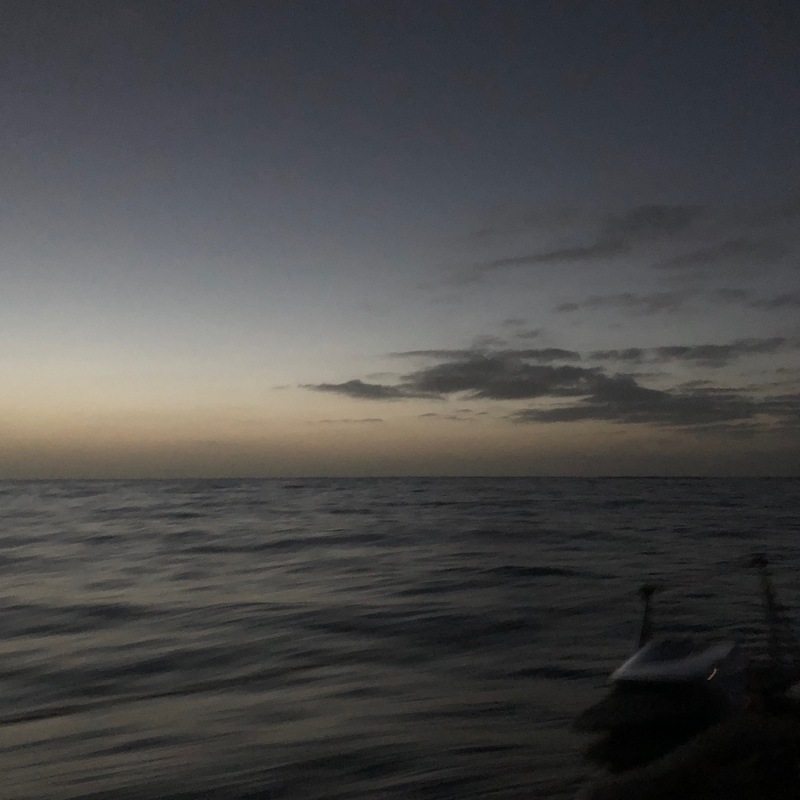 After 3 days and 2 nights at sea, we arrived in Bahia Tortuga in the evening on October 31st. I love this little snippet of James at the helm just before sunset that night. Great thanks to Gabe for this, and for several other photos here. Gabe has sent us a zillion photo and video files, and I will share some of those in another post when I've had time to sift through them! This one if you gaze back behind James, is a really great sense of the sea rolling along behind us and therefore of the ship at sea. A few minutes later, I furled the main sail. Gabe shot a rather magnificent video of this. Should you wish to see me really engaged with my ship, or simply wish to see my behind in striped shorts for six and a half minutes, here you go! Our boat has in-mast furling. Most commonly, a sailboat's main sail is draped and tied, when at rest, over the boom, the long arm that sticks out of the mast, perpendicular to the mast and parallel to the water. You "raise" and "lower" this sail quite literally. Rejoice's main sail gets wound up tightly inside of our mast. This is the rig she came with, and it would be very expensive to change, so we decided to give it a try. In-mast furnling has advantages and disadvantages. The main disadvantage is that it is necessary to tension the sail carefully while furling it (putting it away), or else it will jam when you try to unfurl it, which can be quite a bother to solve. On the San Francisco Bay, James did all the furling and unfurling of our main. 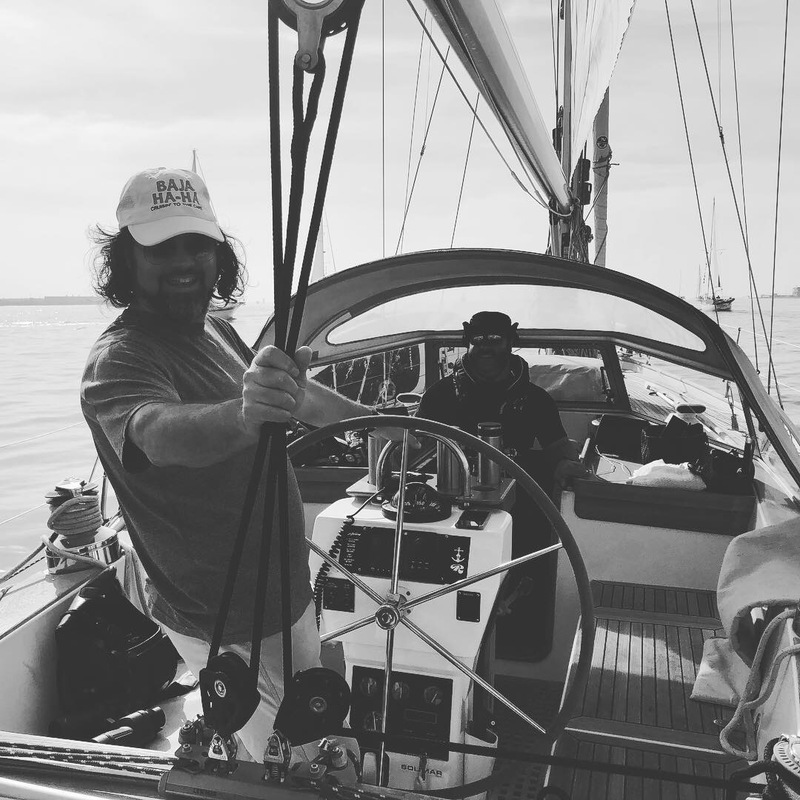 Since departure, we've been surprised and tickled to find that where James prefers the helm; he has a better sense for 'joice's steering, particularly in relation to the wave state, and I love going forward over the decks to deal with the main sail and with our lines. Over time, it is wisest for everyone to be able to handle all tasks, and we're aiming at this, but our default preference has James at the wheel and me as the deck monkey. We arrived in Bahia Tortuga after dark on October 31st. Normally, most cruisers aim never to arrive in a new anchorage after dark. 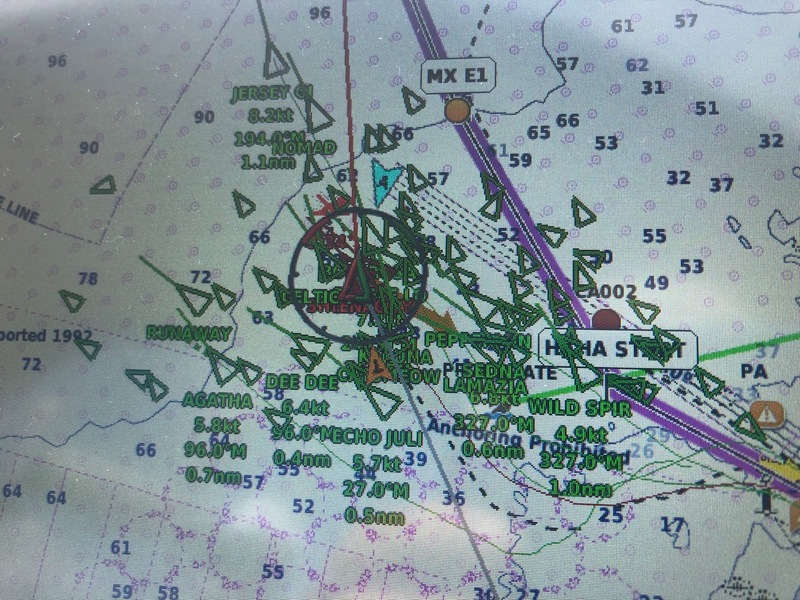 Charts contain errors (ours at one point on this trip said we were on land when we were in a bay, for instance), so daylight for entering a new anchorage is best safety practice. Good sailors are big on safety. I know, if you are not a sailor, spending the night at sea in the dark sounds scary and land sounds familiar and safe, but really, one is better off with less to hit when one cannot see well! We, however, had the fortune to be travelling with our fleet. There were folks who arrived before dark, and the folks who arrived at dusk followed them, and the folks who arrived after dark followed them. As we gathered up approaching the mouth of the bay after having been spread wide for our passage at sea, everyone would reach out via VHF radio to discuss what order nearby boats were comfortable with; a less-confident boat could choose to fall behind a boat with prior local experience or a boat whose chart plotter was showing them the path the boats ahead had taken safely. Forgive this jumpier-than usual video; it's worth the depiction though. Almost all of these lights are boats. 150 boats. 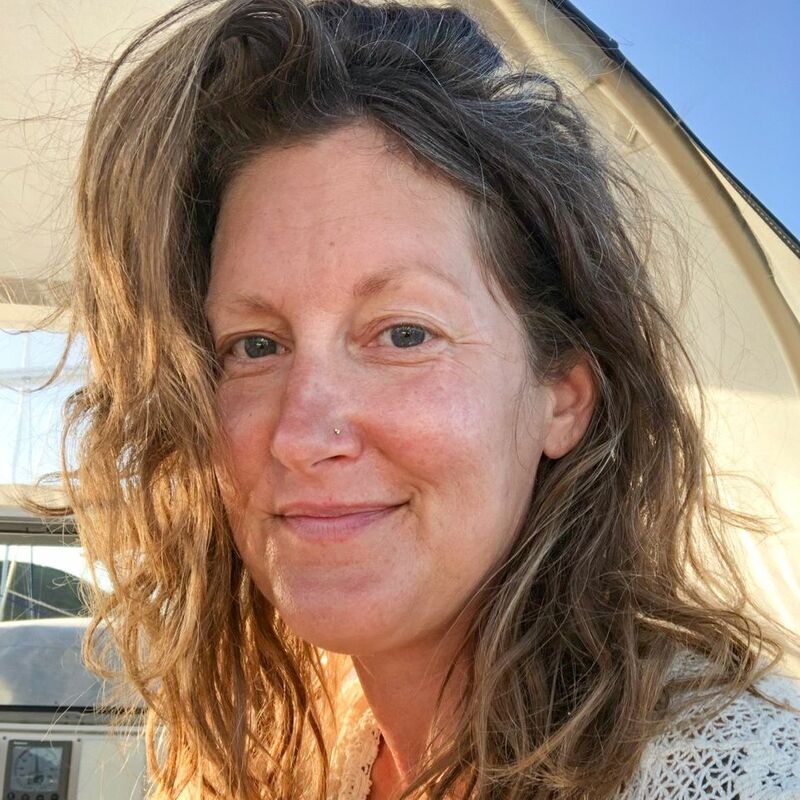 As we came in to anchor, I sat up on the bow (the front tip of the boat) watching for crab pots and fishing lines and poorly lit boats, and reporting back to James over our magic wireless headsets. We slept long and well and then enjoyed a lovely couple of days in Bahia Tortuga. There is a traditional cruisers vs. local kids baseball game which the kids somehow manage to win every year (the Haha's Grand Poobah, Richard, screaming into the announcer's mike DROP THAT BALL when it was caught by the cruisers may have had something to do with it!) The supplies from the baseball game, along with school supplies and clothing, are donated to the local kids. I didn't shoot our time in this bay, apparently. TOO CHILL TO TOUCH THE PHONE. We completed Leg One in good spirits and health, human and ship alike. 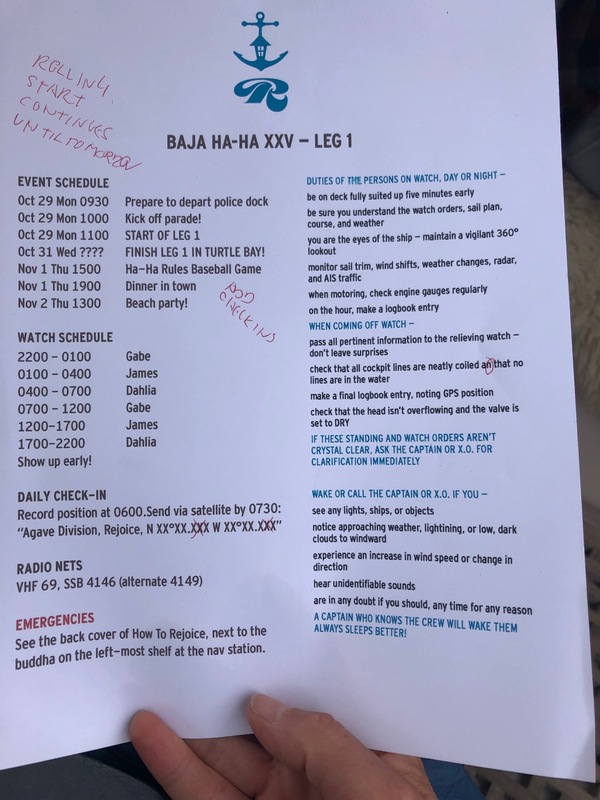 The Baja Ha-Ha is Underway!